Eating is an enjoyable and necessary part of life and mindful eating habits make a big health impact, especially for the elderly. 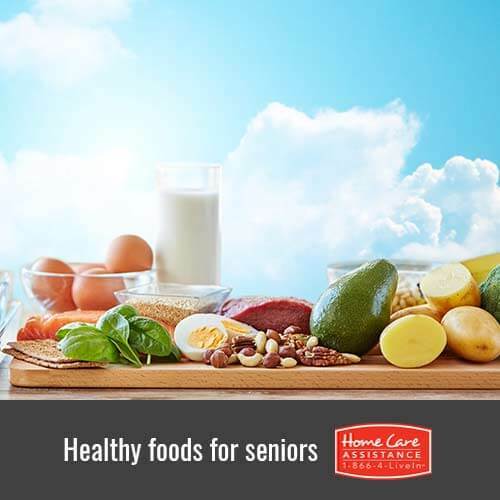 At Rhode Island Home Care Assistance, we know it’s not always easy getting seniors to eat well, but the following general food guidelines for seniors are easy to incorporate and can help improve your loved one’s overall health. Food growing and harvesting has changed significantly with time. It has become paramount to be aware of the negative consequences of pesticides and chemicals on food quality and nutrition. When possible, buy organic foods that have the least amount of harmful toxins. Buying organic can be pricier than buying non-organic foods, so concentrate organic budgeting on fruits and vegetables from the notorious dirty dozen, including apples and peaches. Another approach is to try to buy fruits and vegetables that don’t typically have as many toxins, such as kiwis, pineapples, and bananas. These types of foods have a removable outer peel that often eliminates most toxin exposure while maintaining the integrity of the food. While protein is an important part of the diet, there are many different ways to eat enough daily. Think beyond red meats and chicken and remember that turkey, eggs yogurt, milk, cheese, and tofu all provide a high amount of protein as well. Instead of centering meals around the protein source, use protein as a way to add interest and flavor to an overall dish. Make sure your loved one has a little protein in each meal to maintain overall energy and stamina throughout the day. Seniors sometimes experience a reduced sense of taste and smell with age. Instead of compensating for this reality by using too much salt or sugar, make eating a healthy and tasty experience by choosing a variety of fresh foods from all colors of the rainbow. Local farmers markets are a great place to find fresh and tasty foods in a variety of beautiful seasonal tastes and colors. Seniors require less overall caloric intake than their younger counterparts. It’s okay to enjoy small snacks, but make sure your loved one isn’t ingesting empty calories when snacking. Try snacks such as dried chickpeas, nuts, fruit, or plain yogurt with honey, diced nuts, and fruits. If it seems overwhelming to incorporate all of the food rules at once, begin with one and make it a habit before moving on to the next. Eating is also often most enjoyable when it is a shared experience. If at possible, try to make meals a time of interaction, enjoyment, and companionship. If you provide care for an aging parent and could use help managing his or her care needs, reach out to Home Care Assistance. Our live-in and flexible respite care for seniors ensures he or she will have help and support while you rest, relax, and recharge. Our caregivers can grocery shop, prepare healthy meals, pick up prescriptions, complete basic housework, offer mobility support, and provide companionship and social engagement. For more information, please call (401) 284-0979.